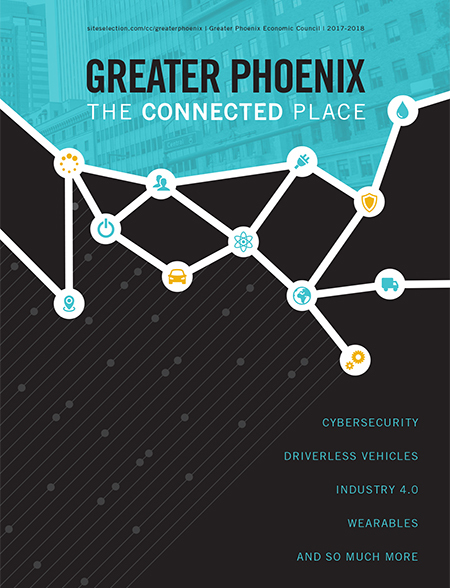 Greater Phoenix is shaping Industry 4.0 and the Internet of Things. no one really knows when the Internet of Things began, but there is little doubt about which region is poised to be its leader: Greater Phoenix. With Intel investing $7 billion to make its semiconductor plant in Chandler the epicenter of a world of connected devices, and the country’s largest research university — Arizona State — in Tempe producing more engineering graduates than any other school in America, the Valley of the Sun casts a wide shadow across the digital universe. Industry 4.0, meet Greater Phoenix 2.0. To say that this is not your father’s Phoenix would be the understatement of the century. Sure, the land of eternal sunshine still ranks as one of America’s great retirement meccas and a world-class golf haven, but chaise lounges and the 19th hole no longer define the area. Technology does. Specifically, the kind of tech that allows your mobile phone, your car and your refrigerator to communicate with the rest of the world. The story behind this technology involves Intel but goes way beyond it. It includes Ingenu, a company you’ve probably never heard of but likely interact with constantly. Headquartered in San Diego, Ingenu recently made a sizable investment to set up operations and hire dozens of high-tech workers in about 13,000 sq. ft. in Scottsdale to facilitate what Ingenu does best: make devices talk to each other. Founded in 2008, Ingenu employs about 130 people who work to provide machine-exclusive wireless networks. The expansion to Phoenix made sense for multiple reasons, says Landon Garner, chief marketing officer of Ingenu. He adds that the concentration of talent in Greater Phoenix should put the market on the target list of every high-tech business leader in the country. Arizona ranks fourth in the nation in semiconductor employment. Arizona ranks second in the nation for space and defense manufacturing. Total manufacturing employment in Arizona exceeded 157,000 in 2014. As of 2014, Arizona was home to more than 4,600 manufacturers, and the average annual wage for a manufacturing job in the state was $69,054. 80 percent of Arizona’s $22.6 billion in exports in 2015 were manufactured goods. The largest sectors were electrical machinery, aircraft, spacecraft, machinery and optics. Green notes that more executives should pay attention to what’s happening in Phoenix.